+1 Create two 1/1 black Rat creature tokens. 0 Target creature you control gains deathtouch. This effect lasts as long as it remains on the battlefield. -5 Until end of turn, rats you control get +X/+0 and gain wither where X is the number of rats you control. also you deck is under standard so I can't suggest any of these. Good Luck!! I personally like to run Go for the Throat over Victim of Night . I would have one in the deck and one in the sideboard, just for the various scenarios. During the beginning of the game, you are very vulnerable. You need some smaller creatures such as Typhoid Rats . They can be played turn one and can effectively block almost any creature. Replace Vampiric Link with these, it will help so, so much. 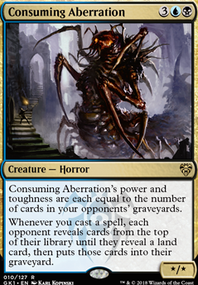 As I said above, Eidolon of the Great Revel is just wasting space, and if you wanted to keep the same converted mana cost, might I suggest Battlefield Scavenger (for cycling faster), Bloodrage Brawler (for an actual blocker), Figure of Destiny , or many more, just not Eidolon. Dimir could go either way, especially if you make these other changes, so you can sacrifice creatures easier. Again, overall I love this concept and want to see this work. Please consider the above, and thanks! It's a nice concept, but IMHO you need to drop some of the nasties in favor of more early drops. You don't need so many nasties, as by the time you can cast them, you'll have had several turns to find them. This is a good article on the subject of mana curves. - https://magic.wizards.com/en/articles/archive/beyond-basics/how-build-mana-curve-2017-05-18 - It goes beyond the usual advice to cover not just costs but when you'll actually be wanting to cast each item. Even after reducing your big mana cost cards, you'll need a lot more ramp. Avoid the trap of just stuffing in great bombs you want to put on the battlefield. In a given game, you won't see most of your deck anyway. As to actual cards, I like Vampire Nighthawk a lot. It's like Gifted Aetherborn 's big brother. Great value. Cards like Typhoid Rats and Pestilent Kathari can plug up the battlefield a bit while you work on getting out a finisher or two. You arent being rude at all. I read about the budget restrictions but its always good to have cards to aim towards as your budget increases, and if we are aiming towards having the strongest build possible eventually, they're cards to aim for. Don't get me wrong, Pack Rat is one of my favorite cards, but personally I have only found use for it in my 8-Ratcks build because it has a strong 8-rack/hand control shell that gives me extra time to use a value generator like Pack Rat. I tried it in my own mono-b aggro deck and found other cards to be more impactful for an aggressive strategy, but for this build im sure it's fine. That bogles player sounds unlucky. Personally I include Spirit Mantle in my mainboard for my g/w bogle list I play in IRL comp just for the rare instances of weird stuff like Typhoid Rats + Viridian Longbow or whatever jank gets thrown at me, plus its just good for pushing damage against tokens or whatever else if you don't have Rancor in hand. Sorry, could talk about bogles forever. Hired Poisoner, Pharika's Chosen, Ruthless Ripper and Typhoid Rats. The first thing I'll say is that with 21 lands, you probably can't expect to get the mana to launch Army of the Damned or a really powerful Mind Grind or Torment of Hailfire. Well, at least without Organ Harvest, of which you're only sporting one copy. 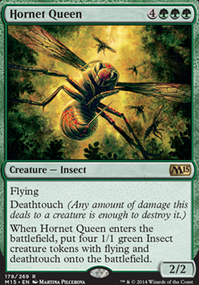 (If you don't play with teammates, or if you don't play with silver-bordered cards, you might replace it with Culling the Weak.) For reference, the math on Army of the Damned is that about 1/3 of your cards are lands = 8/24, meaning you need to survive to turn 17-18 (have seen a total of 24 cards between your opening hand and your draws each turn) to hit that 8th land. That’s a long time in a Magic game. Third, your overall game plan appears to be to stall in the early game for more powerful plays late, since your low cost cards are generally defensive. This means you'll want more lands in your deck so that you don't stumble on your way to those big plays. I'd remove Coral Atoll and put in four Dimir Aqueducts. It's not the ideal play, but it's cheap and there's a lot of upside if your opponent doesn't Ghost Quarter it or something. Anyways, that will take you up to 24 lands AND increase your average mana output a little more, letting you rely on 4CMC, 5CMC, and 6CMC plays to dominate the game. Kraken Hatchling, Mausoleum Wanderer, Pharika's Chosen, and Will-o'-the-Wisp are all fine defensive one-drops, but they all do something a little different. Thornbow Archer is a little more aggressive than the rest of your deck wants, so maybe drop it and pick your favorite of those first four and add a second. Fogwalker is okay on defense, though it's not the best two-drop out there. I'm not a fan of Olivia's Dragon, especially outside of madness/reanimator decks. Rancid Rats just doesn't offer enough oomph for the mana (skulk is not typically a very useful ability). Graf Rats is bad unless you have Midnight Scavengers, so it's really about how much you personally want to meld them. Ultimately, I'd rather replace them with better blockers like Wall of Tears, Wall of Souls, Contraband Kingpin, Dragon's Eye Savants, Gifted Aetherborn, or the absolute top-tier Baleful Strix. Other value options include Omenspeaker, Sigiled Starfish, and Augur of Bolas. Other fun options here are Surge Mare, Riptide Mangler, Lazav, the Multifarious, Fathom Feeder, and Ludevic's Test Subject Flip. Choose your favorites. Alternately, spot-removal like Doom Blade, Victim of Night, Cast Down, Go for the Throat, and sometimes Dimir Charm are pretty effective. Wharf Infiltrator can be good sometimes. You can leave it in for fun or replace it. Eternal Scourge has its uses, but I don't think this deck is optimized for it. Ideally you'd want a few things that can exile it from graveyard or hand, such as Gurmag Angler, Soulflayer, Tombstalker, Scavenging Ooze, Grim Lavamancer), Azor's Gateway Flip (from hand), or the most hilarious option, Serum Powder. As it stands, it's just difficult to kill outside of combat, like a bad shroud or hexproof. Honestly, I don't think you need a 3/3 to be immune to removal. Replace with a finisher, which I'll discuss in a bit. Alternately, one of my favorite defensive 3CMC creatures is Graveblade Marauder, since its offensive capabilities can rapidly increase. Markov Crusader isn't actually very good even in the rare case when you do have another vampire, and you only have one other one. Compare to 4CMC utility wunderkind Kalitas, Traitor of Ghet, 5CMC finishers (like Archfiend of Depravity, Glyph Keeper, Ob Nixilis, the Fallen, Vengeful Pharaoh, and maybe even Serra Sphinx), and 6CMC game-winners (like Noxious Gearhulk, Dread, Kokusho, the Evening Star, Wurmcoil Engine, Grave Titan, or even Vengeant Vampire, though that last one is much worse than the others). Sure, none do exactly what Markov Crusader does, but some are close and they all have incredible upsides. Even something like Shriekmaw might ultimately gain you more life by just killing something outright, plus it's super-flexible. Heck, Soul Ransom and Mind Control are strong cards too, at least against creature decks. Anyways, Markov Crusader is a card to replace. Midnight Scavengers is okay, especially if you have a lot of disposable deathtouchers to bring back, but it still doesn't compare favorably to the above finishers unless you really want to meld it with Graf Rats. Remember, doing things you want to do is an important part of MTG. But if you don't care to meld, I'd look to replace it. Ob Nixilis, Unshackled is fine. In most cases it doesn't compare favorably to the 6CMC critters above, but it has its uses. If you've got a lot of little deathtouchers (Pharika's Chosen, Typhoid Rats, Dire Fleet Poisoner, it can grow really out of hand. Also, Field of Ruin forces a library search. Elder Deep Fiend is fine. Usually you play it in a deck that has plenty of creatures you don't mind (or are better off) sacrificing (for example, Priest of the Blood Rite, Relentless Dead, Doomed Dissenter, Stormbound Geist/Geralf's Messenger), then you emerge it early and tap down lands. That's not really your plan here, so it's probably not the best choice. Some good choices for replacements are above, but within the category of emerge creatures, I think Distended Mindbender fits your deck better. Organ Harvest is a powerful card, but has some drawbacks. Most importantly, a lot of people don't play with or against silver-bordered cards. They're not legal in any official tournaments. Tournament legal variations are Dark Ritual, Culling the Weak, and Ashnod's Altar. Other than that, it's a card that is useless in many situations and completely changes what you're able to do when you actually can make use of it, and that can be awkward from a strategy perspective. If you don't have creatures, you can't cast it. If you don't have a big spell in your hand, you don't need to cast it and you'd rather have almost any other card. So it wants your deck to be full of disposable creatures and big spells, like an emerge deck or a zombie deck really making use of Army of the Damned and From Under the Floorboards. But for the most part that is not this deck, so unless you want to build around the card, I'd remove it, either replacing it with Dark Ritual which is always useful when drawn early, or something else that's cheap and effective: Dead Weight, Apathy, Doom Blade, Pharika's Chosen, or whatever. Sorcerous Sight is worse than Peek and Gitaxian Probe, but I don't think any of those are particularly good in your deck. If you want to know what's in your opponent's hand, play Telepathy. Otherwise, there's better card draw: Preordain and Ponder are the best cheap spells, but it might be worth spending more mana for more effect with Sign in Blood or Chart a Course. Cemetery Recruitment isn't particularly good with so few zombies. You can add more zombies, or switch to Ghoulcaller's Chant/Find / Finality/Recover/Disturbed Burial/Death Denied to simulate the effect, or just do card advantage the old-fashioned way, with stuff like Sign in Blood/Consult the Necrosages/Read the Bones/Notion Rain/Secrets of the Golden City. Alternately, shred your opponent's hand (and lose friends) with Hymn to Tourach or punch your opponent for cards with Shadowmage Infiltrator. If you're committed to bringing creatures back from the dead, look to Zombify, Extract from Darkness, or Isareth the Awakener, which can randomly run away with the game if your opponent doesn't have an answer. The most efficient reanimation spell is Unburial Rites, but you'd need to splash white for it to be better than the above options. Contingency Plan doesn't actually net you any cards in hand; you just control what you are going to draw later. Since you're not very graveyard-focused, there's little benefit. The more flexible version is Dimir Charm, and the more powerful version is Lim-Dul's Vault. If you want to stack the top of your deck for 2CMC without wasting a card to do it, there's Diabolic Vision, but the 1CMC Preordain and Ponder are worthy as well. Alternately, raw card advantage is an option. Any of the options I've already listed are fine, but here are some more: Chemister's Insight, Foresee, Deep Analysis. Mind Grind attacks on an irrelevant axis. Recommend replacing it with a finisher unless you add more mill. If you want a non-creature finisher, Ob Nixilis Reignited is pretty cool. If you just want something that can't get Murdered, there's Sphinx of Jwar Isle. Torment of Hailfire is possibly workable if you go to 24 lands with Dimir Aqueducts. X=3 is pretty much the bare minimum, and if they have cards in hand even that might not be enough. This is a possible swap for a finisher, as above. Army of the Damned is hard to cast at 8CMC. Recommend replacing it with a cheaper finisher unless you're all about Organ Harvest. Apathy is pretty decent at 1CMC. Probably not as good as just casting Doom Blade/Go for the Throat to kill the thing, but definitely more interesting and fun. It can stay in, though swapping it for something more reliable is technically the correct decision. Strange Augmentation is bad in your deck. While +3/+3 for 1CMC is fine in a very aggressive deck, that doesn't seem like your game plan. Ideally, your finishers are big enough to win without the extra P/T. If they're not, these could be replaced with kill spells to make sure they are. Tormod's Crypt is useless unless you frequently play against graveyard-based decks. Even then, with only one in the deck, you're in bad shape. I'd swap it for Relic of Progenitus or Sentinel Totem if you really need graveyard hate. If a creature is reliable against those graveyard decks, Deadeye Tracker, Nezumi Graverobber, or Withered Wretch can do some work. Agent of Erebos is another option. 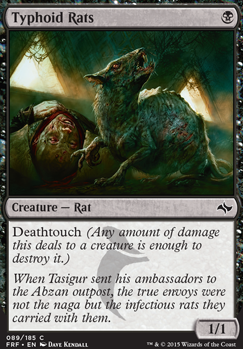 If the only things you need to exile are creatures, then Cemetery Reaper, Dimir Doppelganger, and the powerful Kalitas, Traitor of Ghet are options. Otherwise, cheap kill spells, counterspells, or even more expensive exiling removal (e.g. Sever the Bloodline, Silence the Believers) are options. Phyrexian Scriptures is another card I'll mention, just 'cause it does lots of stuff. Nevinyrral's Disk is pretty good. Go ahead and keep that in there. Gridlock is okay, but it's basically a Darkness you can use aggressively. I think Sleep is generally better at that. 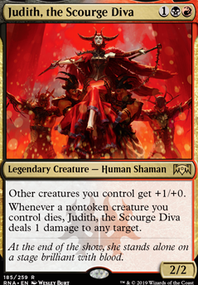 Alternately, if you want a mass-defense spell, Yahenni's Expertise, Languish, and Damnation are the go-to sweepers. Outwit is way too narrow; most decks don't target players. (The primary exceptions are burn and mill, so if you play against them a lot, it might be fine.) 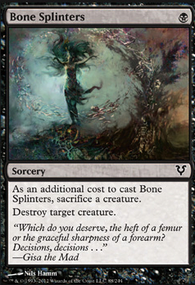 If you want a dollar-cost-effective counterspell in that slot, play Counterspell or MAYBE Dimir Charm for flexibility. Turn Aside is okay, but mostly outclassed by Dive Down or Counterspell. Murder is fine. (Card-wise, not morally!) Technically Hero's Downfall is better if you can get one. Liliana Vess is fine, but she's a little slow. 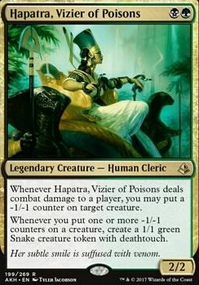 I'm not sure whether she's better or worse in this deck than Jace, Unraveler of Secrets, Ob Nixilis Reignited, Ob Nixilis of the Black Oath, or even Ashiok, Nightmare Weaver. My inclination is that those are stronger as you increase the median quality of the cards in your deck (making Vess's -2 less important). That's just one take on the general strategy. Ultimately, (I think) you're playing Dimir Midrange, and so you're looking for about 40% (24) lands, 30% (18) things that keep you alive until you have 4-6 mana, 20% (12) things that kill your opponent and are themselves hard to kill, and 10% (6) things that put you ahead on cards just in case you're not drawing the right part of your deck.